Things are really heating up in the tablet market, and not only among compact, low-cost models; Microsoft's Surface RT tablet is bringing the fight straight to the iPad table as well. 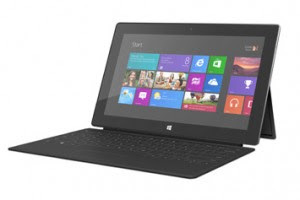 It's full name is the Microsoft Surface with WindowsRT, as it comes with that version of the operating system. It's the first tablet that Microsoft has ever produced, and the first Windows product to feature an ARM CPU instead of an x86-based processor - in this case a quad-core 1.4GHz Nvidia Tegra 3. The Surface RT is available with 32GB or 64GB ofstorage; the 64GB model costs £559 inc VAT, but it comes with the Touch Cover keyboard, more on which later. This Windows 8 tablet has a few neat tricks up its sleeves It's a ground-breaking tablet, then, and fittingly it's a beautifully made one too. The chassis consists of smart, gunmetal-grey aluminium, with chamfered edges all around, and half of the rear panel flips out to form a sturdy kickstand. The tablet has a USB port on the right, which allows the connection of storage, keyboards, mice and, so Microsoft claims, thousands of other peripherals, including printers and scanners. There's a volume rocker on the left, the power button sits in the top-right corner, and underneath the kickstand there's a slot for a microSDXC card, so you can add a further 64GB to the current 32GB or 64GB of included storage. You'll most likely need this slot if you buy the 32GB version, as after the operating system and included software have taken their chunk only around half of this is left. The display is superb. It's a 10.6in, 1,366x768 IPS display, and we measured its maximum brightness level as 400cd/m2 - just behind that of the 3rd generation iPad. Colours leap out of the screen and the viewing angles are near-flawless, with almost no colour or contrast shift as you tilt the screen away from you. The screen is great, though not high-resolution like the iPad 4 or Nexus 10 We were initially impressed with the screen's contrast, as its deep blacks helped give punch to the colours. However, this is in large part due to the Surface RT's automatic contrast system, which dims the backlight slightly when the image on the screen is largely dark and bumps it back up again when things brighten up. This makes still images look great but can be irritating when watching movies, and it can't be switched off. The Surface RT isn't all about entertainment, though. Microsoft also includes a copy of Office 2013 RT Home and Student with the tablet, and to make the most of the Office software you can buy a selection of optional keyboard covers to go with the Surface RT. These clip firmly to the bottom edge of the tablet with a series of magnets and double as cases, flipping around to protect the screen. What will make or break the Surface RT isn't its hardware, however, it's the operating system - Windows RT. At first glance this looks identical to Windows 8, with the Windows 8 Start Screen overlaid on the Windows 7-style desktop, taskbar and system tray. But because the Surface RT has an ARM-based processor you won't be able to install any older, standard Windows applications. To add software you're limited to the Windows Store, which at the moment lags a long way behind both Android and iOS in terms of the quantity and overall quality of its apps; at last count there were under 20,000, but there's a lot of dross and many major apps are missing, with no BBC iPlayer and no official Facebook or Twitter clients available at the time of writing. Still, with Office thrown in for free, the Surface RT does have a lot going for it. It's the only tablet we've come across with such a valuable software bundle, and the only one we've seen with such flexible USB connectivity. For many people, that combination will prove enough. However, for the sheer quality of its screen, battery life, performance and the selection of apps, the iPad remains our tablet of choice.